Teviotdale Harriers is the third oldest cross-country club in Scotland having been formed in 1889, not long after Clydesdale Harriers (1885) and Maryhill Harriers (1888). However frm the 1960’s there was a tendency for the best Border runners to join Edinburgh Southern Harriers and have more success in the Scottish and British Athletics Leagues. Two Teviotdale runners who did this were Craig Douglas (ESH from 1969) and Ian Elliot (from (1972). In this website’s Fast Pack entry for ESH there are brief descriptions of the success of Craig and Ian with the city club. Then Ian Elliot returned to his original club and Teviotdale Harriers began to achieve greater success in cross-country, road relays and veteran competitions. In the 1986 Edinburgh to Glasgow relay they started off inconspicuously in seventeenth position but by the finish had improved to ninth which won the medals for the most meritorious performance. Apart from Ian Elliot, in that team several athletes were prominent who were to play a major part in Teviotdale’s success for the years to come. Brian Emmerson, Alastair Walker, Rob Hall, Andy Fair and the man who was to be the best of them all, Dave Cavers. The foundation of Teviotdale’s success during the next few years seems to have been a clos-knit group of cross-country runners who often trained together and usually took part in the East District Cross-Country League races which developed stamina and team spirit. In the Edinburgh to Glasgow, Teviotdale’s record from 1986 to 1995 was 9th, 8th, 8th, 5th, 5th, 3rd, 6th, 11th, 8th and 9th. This was an admirably consistent sequence. Other good runners who contributed included Keith Logan, Michael Bryson, Davie Barr, Nick Maltman, Brian Law, Colin Nichol, Alan Reid and Bill Knox. There were several especially good performances by Teviotdale Harriers in this great race. Brian Emmerson was second on Stage one in 1987, Alastair Walker fastest on Stage Five in 1986, Keith Logan fastest on One in 1989, Andy Fair fastest on Five in 1991 and Dave Cavers second fastest on Six in 1993, only twelve seconds slower than the great John Robson. The team that won the well-deserved bronze medals in 1991 included Emmerson, Walker, Logan, Davie Barr, Fair, Cavers, Elliot and Hall. Had it not been for the Stage Eight record-holder, Cambuslang’s Andy Beattie, the Borders men would have stayed second instead of missing out by only 14 seconds. In the East District Cross-Country League, Andy Fair recorded one victory and Dave Cavers at least ten! Teviotdale Harriers won this League on three occasions, breaking the Edinburgh monopoly. They also won the East District Championship team trophy in 1991 and won six silver medals and one bronze in the East District cross-country relays. In the Senior National Cross-Country Championship, Teviotdale finished fourth team in 1986, fifth in 1987, ninth in 1988, second in 1989, seventh in 1990, third in both 1991 and 1992 and fourth in 1993. Once again this proves how consistently good the Harriers were at this time. Highest positions, apart from Dave Cavers, were Brian Emmerson 23rd, Alastair Walker 7th, Ian Elliot 14th (in 1991, the same year, he won the Scottish Veterans title), Rob Hall 27th, Keith Logan 35th and Andy Fair 23rd. Silver or bronze medallists included these athletes plus Davie Barr, Brian Law and Michael Bryson. Perhaps the greatest team triumph took place on 28th October 1989 when Teviotdale Harriers won the Scottish Cross-Country Relays at Inverness. Keith Logan, Rob Hall, Alastair Walker and Dave Walker won the gold medals. Teviotdale enjoyed a purple patch in the Scottish Veterans Cross-Country Championships, with team silver in 1990, gold in 1991, silver in 1992, gold in both 1993 and 1994 and bronze in 1995 and 1996. Ian Elliot and Brian Emmerson were the main runners, but Jim Knox, Andrew Shankie, Robbie Rae and Nick Maltman also contributed to these successes. After a very successful career with ESH, when he returned to Teviotdale, Ian Elliot won two M40 Scottish Veteran Cross-Country titles in 1991 and 1992. Brian Emmerson kept improving after he turned forty. 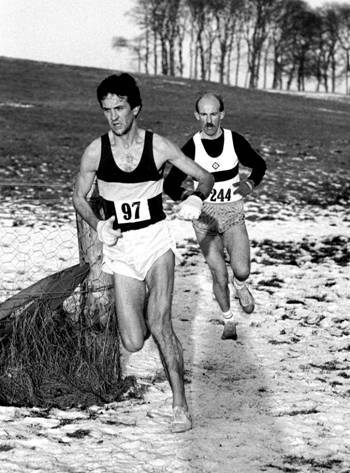 In 1989 he was third M40 in the British Veterans Cross-Country Championship at Sunderland, close behind GB International Andy Holden and Aberdeen’s Colin Youngson. In 1990 he won bronze in the Scottish Vets Cross-Country. However his finest running was in the next age-group. Brian won the Scottish Veterans M45 title in 1994, 1995 (second in the race behind M40 Brian Kirkwood) and 1997. In 1995 he also ran in the National Senior, finishing an outstanding 51st at the age of 46. What could he have achieved if he had taken the sport seriously in his twenties? Alastair Walker won the most valuable award in Scottish athletics when he finished first in the 1990 Shettleston Harriers Six Miles Cross-Country James Flockhart memorial Trophy which is held in honour of the 1937 ICCU International Cross-Country Champion. Rob Hall won the 1987 Dumfries Half Marathon and the Bo’ness 10K. He ran for Scotland twice in the Home Countries Marathon International which at the time was part of the Aberdeen Marathon. Rob was third in 1987 (in front of two Englishmen, the other two Scots and all three Welshmen) and fifth in 1989. Nick Maltman was sixth in the Scottish Veterans Cross-Country in both 1996 and 1998 and ran for Scotland in the annual Five Nations Veterans International. In 1996 he tried hill-running and was first M40 in the Grasmere Gallop. Dave Cavers was a most remarkable cross-country runner, who also completed one very good marathon. His ten victories in teh East District Cross-Country League have already been mentioned, as well as his many contributions to Teviotdale’s best team performances. In addition he was East District Cross-Country champion six times between 1992 and 2001. However it is Dave’s record in the Senior National that is most amazing in its high quality and consistency. Between 1989 and 2001 he was second, fourth twice, fifth twice, seventh, eighth twice, ninth, tenth twice, twelfth and fourteenth. If only Scotland had not been excluded from competing as a separate nation in the IAAF World Cross-Country! Dave’s silver medal in 1999 was won at Beach Park, Irvine, when he was defeated by Bobby Quinn but finished in front of Tommy Murray, Phil Mowbray and Tom Hanlon. When he was fourth in 2000, the three in front were also very high quality GB Internationals – Quinn, Murray and Glen Stewart. In 1998 Dave Cavers surprised many when he entered the Rotterdam International Marathon and recorded the fastest time by a Scot for several years – 2:16:06. He was selected to compete for Scotland at that year’s Commonwealth Games. Unfortunately this took place in Kuala Lumpur Malaysia, which proved extremely hot, humid and totally unsuitable conditions for long distance running. Dave Cavers was also unlucky to contract a virus and did not finish the race. However by November 1998 he had recovered in time to win the Derwentwater ten miles road race in Kendal. Dave Cavers continued to run cross-country until 2008 before retiring after an outstanding career.